It was late January in 2006. Trying to reduce my workload I decided to stretch out my degree and for the first time I didn't have any production courses in my semester. This was the downside, and because I didn't yet have a YouTube channel to keep me entertained with mini-projects I was on the look out for contests and festivals that I could make a new movie for. All this festival thinking was pretty new to me at this point. I'd only been a part of the Medicine Hat Film Festival and Youngcuts with my film Keys to Existence earlier in 2005, but little did I know that I was on the verge of doing something pretty big. On the Youngcuts festival website they always had little blurbs about contests and festivals that were going on, and because I'd had my film in Youngcuts itself, I often checked the site every few weeks to see if there was something else I could take part in. I came across a link for the Make Shorts, Not War! Contest being put on by the National Film Board of Canada and Citizenshift right after Christmas, but had pretty much brushed it off and decided I didn't want to do it. The basic idea was that you had to make a short film that embraced a message of peace and that included archival footage of Canadians in WWI provided by the NFB on their site. I initially just assumed that their would be too much competition and that I probably wouldn't get in anyway. Well, I kept coming across the link. It was the end of January and bored with my classes already I thought it might not be bad to at least make an attempt at the NFB submission. Things rapidly accelerated from there. The moment I decided I wanted to do the contest was exactly one week before the submission deadline. I had just bought myself a Mini-DV camera that Christmas so this became a good excuse to use it. Feeling suddenly motivated and excited, I got to work. I still have the original notebook where I scribbled my first ideas about the project that would eventually become A Chill in the Air. My idea was a video poem about renewal, using nature for inspiration I focused on how the changing seasons related to the loss and recovery associated with war. The poem came together quickly and the shot list followed that night. With my notes and plans in order, the video was shot and edited the next day - even with my scattered ambition and hunger for personal projects this was a record for me. From concept to completion, the project that I hadn't planned on doing was done in 24hrs time - now it just had to reach Montreal by the deadline. In a strange coincidence, I later found out that the core production class I was taking my year off from, actually provided this contest as one of the short film assignments that students could do. Without even being in the class, I had still managed to give myself a memorable lesson. I don't think things would've gone nearly the same had I been told to do this. A few weeks later I received the news. Out of 280 entries across Canada, A Chill in the Air was an English Top 10 finalist (there was also a French Top 10). There were a couple other entries from Regina students (from my university) that I knew in the finals which lead me to discover the assignment - again, a strange coincidence considering the number of entries submitted. I had my first crack at promoting my film online, and the voting began. I used my first blog to promote the contest to my family and friends, and found myself being voted up week after week. The significance of the contest became more clear when my hometown started to show me some support. The Medicine Hat Newspaper donated $500 of ad space and ran the ad seen above several times throughout the competition. I received numerous words of congratulations from old high school friends, city council members, and really anyone who came across my blog, my emails, or that ad - it was funny to hear how so many of my old friends had heard about the contest because their parents had clipped the ad to show them. I gained enough support to make it to the final round, the Top 4. As the contest neared the end I became increasingly excited. If I won I was going to get a trip to France as an official videographer for the 90th anniversary of the Battle of the Somme. 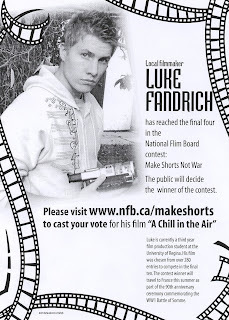 For 2nd place, there was a $5000 production grant from the NFB. They were huge rewards that both had the potential to open a lot of doors. The contest wrapped and the news came on March 31, 2006 (my 22nd birthday) that I hadn't won. I finished 2nd place in the popular vote, but 3rd place according to the official rules. 1st place was determined by votes and 2nd place was completely the judges decision. I was given honorable mention. A nice credit, but that was it. My first major film contest loss was tough to take. With such a quick acceleration into the experience, the loss was like hitting a wall. It's funny how I didn't care about the contest at first, or how I hadn't planned on doing it. Suddenly it was all consuming. By the end (much like my Sasktel Experience) I was so invested in the routine of promoting and talking about the project that it hit me hard when it was all over. It was such a new experience and I didn't know how to handle the loss. I literally came as close as I could to winning without it happening. The worst part is feeling like there's nothing you can do. In the contest I pushed hard and turned to friends and family like I never had before, but when it ended it was tough to know what I was supposed to do with myself. By the summer, when things had settled, I was able to see just how incredible and amazing the experience had really been. Even without winning, there was a lot I took away. Time has healed any loss that I felt then and now I only have nostalgia for how exciting the whole thing was. After the contest ended I had a featured story about my film on the local news and radio stations. A Chill in the Air was later played at a festival at the University of Toronto. I received letters of congratulations from the Premier of Saskatchewan and from the Dean of Fine Arts at the University of Regina. I got a great new credit to my name (and a good story to tell!). And, in July (of 2007) I was asked for a little follow-up from the people at the NFB/Citizenshift about what I was up to now. Here was the blog entry they did. A Chill in the Air became so much more than I ever expected it to. It goes to show how you never know where the opportunities will come from, or how some things just take on a life of their own. 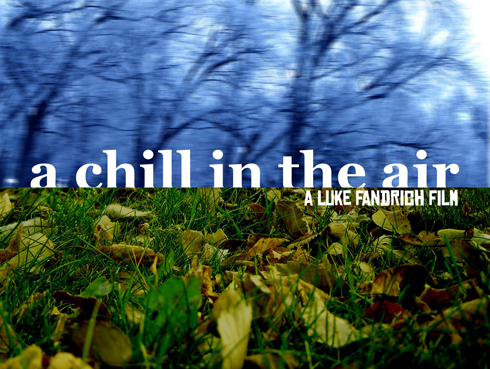 For the first time I've uploaded A Chill in the Air to my YouTube channel. I know I've talked it up quite a bit, but it really is just a simple film with a simple message. I guess sometimes the best ideas just are. A Chill in the Air on the NEWS!